Handmade Flat Woven Kilim Rug - 4'5'' x 7'7'' A brightly colored kilim rug adds a touch of fun and cheerfulness to your home. 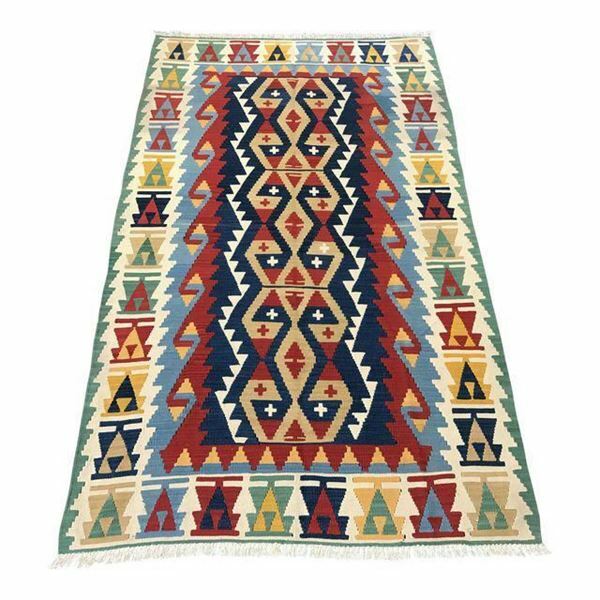 Handmade Flat Woven Kilim Rug is wool, flat-weave rug which updates any room's décor with an eye-catching tribal pattern. Much more than ordinary floor coverings, this kilim rug presented itself as a dowry of a bride. The Turkish Anatolian Kilim Runner Rug is hand-woven in the Aegean Mediterranean coast region of Turkey in 1960s. This flat weave kilim rug is masterfully hand-knotted from 100% top quality wool for enduring beauty. This beautiful piece will withstand wear and tear over time, adding the perfect touch of vintage character to your space for many years to come. This unique vintage kilim is truly one of a kind, and is approximately 50 years old. Adding to the uniqueness of this piece is the top-notch quality and condition it exhibits, this timeless classic has been in storage.